Campingplatz Krossinsee 1930 GmbH is a campsite with 180 touring pitches and 250 year round pitches. During low season, between 01-01-2019 - 14-04-2019, 29-04-2019 - 28-05-2019, 12-06-2019 - 29-06-2019 and 05-09-2019 - 31-12-2019, the nightly rate is €20,- at one of the 180 touring pitches at Campingplatz Krossinsee 1930 GmbH in Schmöckwitz (Berlin). At this campsite you can not only use your CampingCard ACSI for inexpensive camping, you can also use your ACSI Club ID (as an alternative ID). In the green heart of Berlin, right on the Krossinsee lake nature area. Natural grounds between tall pine trees, semi shaded pitches. Modern toilet facilities, bakery with fresh bread daily and an attractive restaurant. Direct connections to Berlin-Mitte. The three lakeside pitches are not available at CampingCard ACSI rates. Nice campsite but spoilt by lots of tatty statics. Most pitches are unmarked and under trees. However the position on lake is very nice, ideal for swimming or kayaking. Free wi fi available near toilet block. We visited Berlin, about 1 1/2 hours by bus, tram and train. A beautiful site, well located, on a large lake. The staff spoke great English and were very helpful to us. Our motorhome is 12 meters long so we often struggle with access, however the access here was very easy and catered for our size with no effort. We would definitely come back to this site. We stayed 4 nights. It was unusual to be pitched between trees with no marked pitches, literally find a space & pitch. Excellent staff who helped plan our journeys to berlin & also an excellent restaurant with good quality food & drink. toilet facilities were both plentiful & clean: showers 50c for 4 minutes. Only drawback just a bit too far out of Berlin, getting to the city centre took almost 1.5 hours if connections were good. I don´t understand why I must pay for "Electrical connection fee" when electricity is a part of the fee? 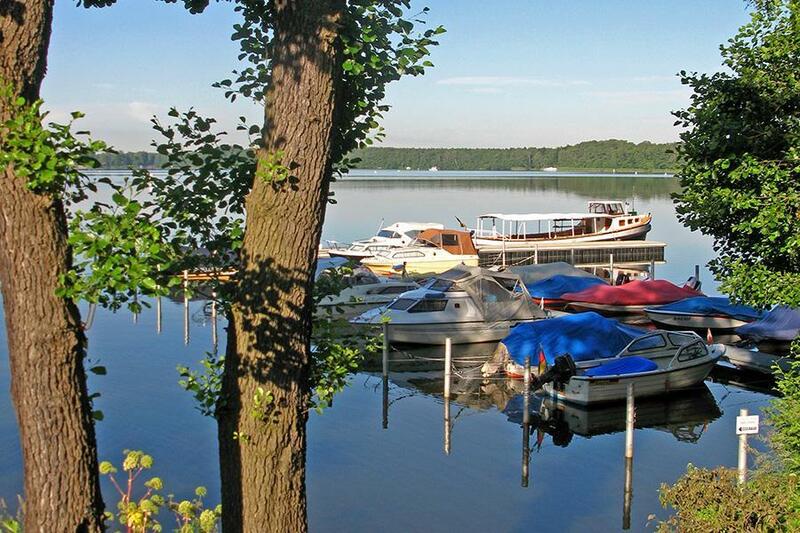 Would you like to book Campingplatz Krossinsee 1930 GmbH or request more information? You can do both using the information below or by visiting the campsite's website. A10 southeast, exit 9 Niederlehme, direction Wernsdorf. Then follow Schmöckwitz camping signs. CampingCard ACSI will send your information request to "Campingplatz Krossinsee 1930 GmbH".